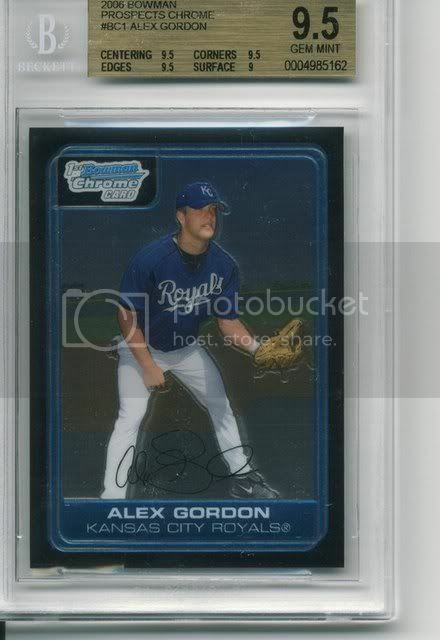 When Alex Gordon first came up I was all about him. I had read so many good things about him, and some people even said he could be the next coming of George Brett (who was one of my other childhood idols... til I grew up and learned he's a nasty drunk). After Sunday's game Alex Gordon was optioned to AAA-Omaha as a result of batting .194 and making 4 errors in 12 games. This was disappointing to me to find out because I had high hopes for him, probably not as high as the Royals but I like following young guys and especially guys that play third. Just a hard position to field, not that any major league position is easy, but you get the point. Anyone else out there start collecting Alex Gordon when he came up? He is one of the guys that I pick up singles of at shows or when I find them, but I don't go out of my way to collect him. I have his Bowman FY card graded here, along with a bunch of extras... oh well. Alex Gordon may be down on his luck, but you aren't! Congrats on the Beckett bling! I don't actively collect Gordon but I was stoked to pull his auto from a USA Baseball box set when the hype about him was huge! I want his rare mistakenly-released topps card for completeness, but I'm settling for the affordable option of the reprint that was part of the "cards your mom threw away" in 2010 topps. I'm in the same boat as you . . . I don't actively seek him out, but I'd take what I could get. They are moving him to left field, which will do nothing to fix his broken swing. Broken dreams, that's for sure. Remember when his one rookie card was short printed and worth like 5000 dollars?? It probably is worth like 5 now... Where has the love for Gordon gone?? How does that old Wall Street saying go? Sell on the hype, buy on the news. What to do with error cards? What made 2010 Bowman so popular? The big Bowman hit gone? I accidentally went to the card shop. Do you buy or sell now? Sunday Question: Got any chicle?